We would like to congratulate Dolphin Leisure, otherwise known as Dan and Tony, for the superb swimming pool and enclosure they designed and installed for us. Everything, The ground works, landscaping, electrics, pool and enclosure were expertly and efficiently dealt with, after sales too are superb, with only a phone call needed to get advice or help required. We are now enjoying the benefits of all their hard work, and would not hesitate to recommend them to anyone considering having a pool installed. Very many thanks to you both and all your team. Mike and Fran, Pevensey, East Sussex. Kafko Polymer Panel pool and IPC Enclosure project. I could not leave it without writing to express my sincere thanks and appreciation for the way I have been treated by you, Paula and Dan regarding my problems with my pool cleaner. You have all gone to extremes to get me out of the situation I was in and regard your service as second to none in any company I have had dealings with in the past. You have my admiration and thanks for all you have done. I can recommend your company to anyone and everyone! Dolphin Leisure (UK) Ltd are completely dedicated to your total satisfaction. If you have any suggestions or comments please email us using the link in the Online Store. Here at Dolphin Leisure our aim is to give you the best possible advise on which swimming pool, hot tub or type of equipment would be suitable for your individual circumstances. With over 27 years of unique swimming pool and hot tub experience we are able to advise on all aspects from location to completion. With one of the most comprehensive ranges anywhere in the UK, we have a pool or spa to suit all requirements and budgets. Established in 1987, Dolphin Leisure is still a family run business. Every member of the Dolphin team has "hands on" experience of both in-ground and above ground swimming pools and all types of hot tubs and portable spas - we don't just supply boxes! We like to call this unique specialist experience combined with customer service, quality products and value for money prices - 'the Dolphin Difference'. For our many customers 'the Dolphin Difference' simply means achieving a successful project. Most pools, spas and equipment are installed by our customers themselves (in some cases all over Europe) and they do so, secure in the knowledge that they will be supported with friendly help and assistance throughout the project. Over the years we have tried and tested many products which may appear on other web sites. Sometimes, we have opted not to supply these products because they have not met our stringent requirements - usually as a result of poor back up service from the manufacturer/importer or the quality of the product itself. We believe our integrity to be our most valuable asset , so you can rely on Dolphin Leisure - we don't make false claims to be 'the lowest price in the UK' or 'guaranteed lowest price' although in many cases you will discover that we actually are. Over the last 5 years we have become 100% 'on-line' orientated and as a result we no longer have the need to operate a showroom. We have invested heavily in constantly updating and improving our on-line web shop and you can be confident that the 'personal touch' and all the expertise we accumulated as a well established and knowledgeable company is still available to you. I have been using Dolphin Leisure for all my spa requirements for just over a year and despite living in Kent the service has been extraordinarily good. Not only that, but their advise has also been of great use". "what a pleasure it was to do business with you...gold service...I am over the moon with the pool...so thanks for everything, your time, your help and the end results". Mrs G of Duston, Northampton, Esther Williams 18' Classic with fan deck and fence. "I would like to say a big thank you to you all for helping me with the construction and I hope that I wasn't too much of a pain with all the calls I made to you. We are very very pleased with the end result and although the weather hasn't been brilliant, the few hot days we have been able to enjoy the pool. It makes all the hard work worthwhile. We seem to be very popular now with many friends and can't think why !" "I am writing to tell you how very pleased we are with our swimming pool. We are already using it daily. Also to say that the speed, efficiency and workmanship was first class and we know that should there be any problems in the future you will be there to help us. We shall, of course recommend you to anyone who expresses a wish for a swimming pool. Thank you all for making the installation of the pool a very easy and pleasant experience which in this day and age does not happen very often!" "May i just say how very much impressed we are with the service we have received from yourselves, from the service on the phone to the literature you sent us and your website. We did look at other companies but nobody else came close". Please find some photos of the 12' pool we purchased from you in June with decking surround and changing hut. Just a quick thank you for all your trouble you went to to help us prove that we had done nothing wrong with regard to planning permission for our pool. We have been cleared of all wrong doing and false accusation. Many thanks again, wishing you all the best. Thank you very much for such an excellent service. I shall recommend Dolphin to all my friends - as a matter of fact I do already but your expediency in replacing my Pool Shark cleaner is worthy of extra praise! Andrea and I would like to once again thank you and the Team at Dolphin Leisure for making it possible to buy the Catalina Classic XL4000CD Spa. You really feel like you are a member of the Dolphin family when buying your Hot Tub from Dolphin Leisure. One thing we really appreciated was how you were able to arrange a special order for a color combination that was no longer offered in Europe. Moreover you kept us constantly updated when the tub a) left the factory in the USA b) arrived in the UK c) was picked up by the shipper. Your shipper used a local company here in the mountains of Switzerland, who actually knew us (they helped us move the tub into place in the back yard) You also answered our questions and advised on the right accessories (the covermate 11 underside, comes to mind) Finally you had the lowest price we found on the internet and we certainly saved £££££'s versus a local supplier. A note about the Catalina XL4000CD. This Hot Tub has it all and is truly a joy. We use it about 3 - 4 nights per week and find it easy to maintain. It is a great package that includes everything on our list. Lots of jets, nice lighting and the Trevi fountains are great to sit under. It also has a good stereo system. Finally the Ozonator seems to work well and I just quickly clean the filters every two weeks (in addition to adding the normal chemicals). The jets are high quality and the Balboa control unit commissioned on its own and simply started working. The Hot Tub's compact size also allowed us to fit it into a tight space. Overall you can't ask for a better tub at that price. Thanks and regards from Kublis Switzerland. Just a quick word of sincere thanks to you for all your help over the last couple of weeks. I came across Dolphin Leisure by accident on the internet and I must say that your customer care was over and above anything I've ever experienced - as a consequence of this I can assure you all my further pool requirements (chemicals etc) will be purchased from you and you alone! 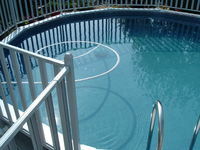 As you can see from the photos – the pool installation is complete. We are really delighted with the pool, and installation was easy, especially after all the advice we received from you before the pool was shipped (to Bordeaux). As a result, we avoided all the pit-falls, except from one, which was down to me for not reading the instructions! But what really was a great help was you being available on the end of the phone – with instant advice and support and encouragement. Would we buy another self-build pool from you? Definitely!!! Great prices and first class customer service - we couldn’t ask for more. "Dolphin's quality service has been outstanding, from initial contact to completion." I would like to thank you both very much for your assistance with this massive swimming pool project, to which without your help it would not have been possible. As you can see by the pictures, the beginning and the end results are quite impressive. There is a little more landscaping to be completed which will make things even better. I will be contacting you in the week regarding bilge pump and chemicals. once again regards and thank you very much, we are very pleased with the end results. Just a short e-mail to thank-you for the assistance/advice and prompt service in despatching our order. The items arrived this pm and we have now asked the pool man to install them. Many thanks again for the prompt and courteous service from you and your company. Further to my telephone conversation with Paula today, please find enclosed the damaged part of the pool liner. For your information, the position of the puncture was at the very bottom of the wall close to the seam with the bottom/floor section. I look forward to receiving the replacement liner.